Google’s Calendar feature has become a popular part of the company’s suite of online tools. Yesterday, it became even more popular among Mac users thanks to support for the CalDAV protocol—a way to store, access, and edit calendars online, and a protocol supported by Apple’s iCal. Yes, this means that you can now use iCal to work with your Google-hosted calendars, editing and syncing events from one to the other, and even responding to invitations. But this isn’t a review of Google Calendar. Rather, I’m highlighting another useful (and free) tool Google recently released, Calaboration . Back when Google first enabled iCal compatibility in beta form, adding a Google-hosted calendar to iCal required several steps that included copying complex URLs from the Google site and pasting them into iCal. 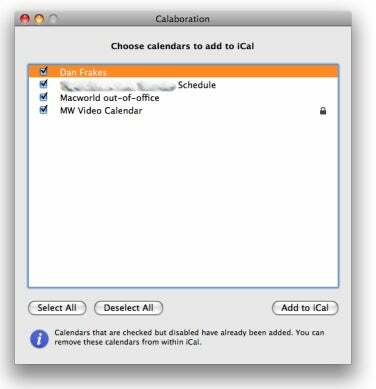 But now that iCal support is official, Calaboration makes the task a snap. After launching Calaboration and entering the email address and password for your Google Calendar account, the program shows all your Google Calendars. Just check those you want to work with in iCal and click on the Add To iCal button; the next time you launch iCal, those calendars will appear in the calendar list and will automatically check for updates. (Because of the way iCal and Google Calendar interact, each Google calendar will appear in its own section in iCal's list.) You can create and edit events in either place—iCal or the Google Calendar site—and those changes are synced instantly; they appear in the other location once you refresh. Note that read-only calendars are grayed out in Calaboration unless you enable them in Calaboration’s preferences. The reason for this is that iCal doesn’t properly handle read-only CalDAV calendars. Specifically, it doesn’t check the permissions on those calendars, so it appears to let you make changes, but when you try to sync those changes with the server, you get an error. Calaboration is smart enough to check Mac OS X’s Address Book to see if your “Me” card matches your Google Calendar account email address. If it doesn’t, you won't be able to respond to event invitations for Google-hosted calendars, so Calaboration displays an explanatory dialog with a button to open Address Book so you can create (or designate) such a card. One issue a Macworld colleague experienced is that Calaboration showed a particular Google calendar as read-only, even though he has write access; when he forced Calaboration to add the calendar to iCal anyway, he was indeed able to edit events. Calaboration correctly displayed the same calendar as writable for me from the start. One other minor complaint I have is that each time you launch Calaboration, you have to enter your Google Calendar email address and password. Although, to be fair, I suppose most people won’t be adding new Google Calendars to iCal frequently, and if they are, they’re just as likely to be adding calendars from different Google Calendar accounts. It's also worth noting that Google Calendar’s iCal integration itself isn’t yet perfect; I’ve experienced a number of minor issues. But I can’t blame these issues on Calaboration, which does exactly what it’s supposed to do and is very easy to use. Kudos to Google for creating this useful utility. Updated 12/3/2008, 4:30pm: Deleted comment about an inability to remove Google calendars from iCal; these can be removed in the Accounts section of iCal preferences.